What If? The Movie, A Review | Let's Live Forever! New possibilities for existence are introduced by asking “what if?” questions, that allow us to consider these possibilities without having to decide right away whether we want to take a deeper interest in them. In the movie, we are first shown some history of mankind’s outmoded beliefs, and how we have limiting beliefs programmed into our subconscious mind from an early age—and how we can change this programming. Then it moves onto talk about gene activity being controlled by our minds, people who have healed themselves from within, people who live without eating, overcoming aging and death, and last but not least, finding fulfillment from knowing who we really are and expressing our true nature. The key is in the cast. I found the speakers in What if? to be warm and intelligent, and to have the natural assuredness of people who have lived with their ideas and beliefs for a long time, and developed great expertise in their field. Quite a few of the 30 or so speakers in the movie come from the science and medical professions. Dr Joe Dispenza, a neuroscientist and chiropractor, has great knowledge of the specifics of the mind-body connection, and Bruce Lipton, Ph.D. was a career biochemist whose book The Biology of Belief is about his discoveries about how our beliefs influence our gene activity. Bernie Siegel, M.D., who has a background as a surgeon and prefers to be called “Bernie”, started Exceptional Cancer Patients, a specific form of individual and group therapy utilizing patients’ drawings, dreams, images and feelings. Other cast members include Brandon Bays, who I wrote about in my post The Journey, With Brandon Bays (I first heard of her from What if? in January and jumped at the opportunity to go to her workshop when she visited Melbourne in February), Joanna Cherry, founder of Ascension Mastery International, and Dan Brule, breathworker extraordinaire (my description). And James Sinclair, producer and director of the movie, who speaks very eloquently on camera and in narration, about his thoughts and visions of what is possible. There are far too many great people in the cast for me to mention them all—there are bios for the What if? cast here, if you wish to explore further. I found What if? very inspiring… I already knew we are capable of healing ourselves of anything and fulfilling our potential, but seeing this movie gave me an extra boost towards making it happen in my daily physical life. An extra level of confidence. It had something to do with seeing all these intelligent, thoughtful, gracious people so calmly sharing their experiences and knowledge, that made me feel “yes—we can do this”. I’d also like to say I very much liked the music! I thought it was very moving and enhanced the feel of the movie at the right times, without being intrusive. I bought the DVD, which has bonus footage of the cast members speaking, and a director’s commentary of almost the whole movie, narrated by, well, the director, James Sinclair. I loved the director’s commentary—I always enjoy getting the inside information, especially when the topic is something I’m rather interested in. What if? is available as a download (for $4.95) as well as a DVD, from the What if? website. 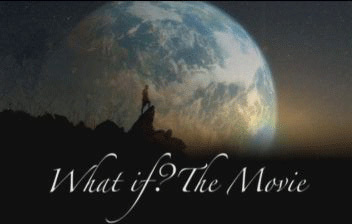 I’d like to finish with a “what if” question posed by Dr Bernie Siegel—he didn’t ask it in the movie… I found it buried away on the website in the testimonials section and thought it captured the tone of the movie—profound, yet light-hearted—rather well. Maybe it might help us to re-define what is “normal”. Evelyn Lim’s post My Personal Creed has a short review of What if? at the end. If Jesus would have been the only person every alive, He would not have incarnated, He lived and died for us all. What a WONDERFUL review! I need to order the DVD to see those extras — sounds great! In answer to your question — I think that is what Jesus was trying to tell us. We ALL are children of God. We all have powers beyond our wildest dreams. We are all healers and can manifest if we believe and love ourselves and our Source/God. These are truly amazing times and never did I imagine God would have anything to do with health a few years ago. I have been awed by all the miracles I witness and this film does a great service in showing us that YES we CAN do ANYTHING! Thanks for linking in related posts! It was so fun to explore this movie with you. I’ve been procrastinating seeing the movie because I didn’t want to spend the money. You have me almost convinced. I’ll check the library first! ( I think I’m limiting myself if I don’t see it). @Miguel – hi there Miguel – maybe it would be “normal”! @Jenny – thankyou Jenny! A agree with you about the message of the Jesus story – well put! Thanks for the review, Robin. Although I generally accept the popular definition of “normal,” I think it’s good to challenge ourselves and ask ourselves whether “normal” could be something completely different – and much better. Thanks for the review, Robin. I am keen to see this, but will wait until MusicMan can watch it with me too. Maybe this weekend. Other than the sun gazing instead of eating, it all sounds fascinating and I do enjoy challenging my beliefs about life – it’s the only way to learn. I think if Jesus were the only normal person to have lived, then a world of miracles awaits, and that’s an idea to hold onto. I haven’t seen the movie, though I absolutely believe we have the power to shape our realities. I would recommend What the Bleep too. @Vered – yes, it is an interesting exercise, perhaps. @Kelly – I think I might be with you on the food thing. Interesting possibilities, though (and I remember reading about saints who didn’t need to eat but could feast all day without stopping if they wanted to – that might be up my alley). @RN4081 – yes, What the Bleep also explores human potentials. Welcome to this blog! @Miguel – hello again – thanks for the input. okay i’m stumped on this one. like what? did the movie mention. i do believe in positive thinking and yes attitude matters. i was reading in scientific american mind of some people who were given plecebos and was told that it was the medicine they needed to heal an ailment. turns out it wasn’t but they healed themselves. later when they found out that the meds was not what it was supposed to be – they got sick. i hope i’m not botching that article, but that’s how i remember it when i read it. very interesting. Hi Natural – yes, the movie went into the programming of our subconscious quite a bit. Family beliefs we take on as our own, things people said to us when we were little, and so on. It also talks about the placebo affect. Your story is interesting, about those people who got better, then got sick again! I have practiced ‘mind over matter’ healing for years. While some may argue that I cannot prove it works, I certainly rarely get sick. As soon as I feel a bit off, I concentrate of ridding my body of the ‘bad stuff’ using a technique I used. While everyone around me is down and out with whatever bug is going around, I am not. Arghhhh…. I just can’t get interested in this one. I feel like I’m missing something because you’ve obviously been taken by this. You’ve written a lovely review and I made it as far as their website. Thought I’d watch the trailer to see if it would lead me farther. The trailer won’t run (for me anyway). I saw and loved The Secret, but didn’t get into What the Bleep. I believe in the principle behind this movie, but maybe What If? is just not for me, or it’s not the right time. 🙂 Love your stuff beautiful Robin! I think that Jesus is a celebrity of “normal”… I think that there are probably quite a few so called normal people all about the place. Childhood experience taught me that self healing is normal. Possibly living forever is just a matter of choice … like most things in life. I figure that one of the reasons that people don’t fancy living forever is the fear of being alone. Great review and yep I will now make time to investigate further. I very much enjoyed “what the bleep…” and thought that “the Secret” was motivational and that the true secret of the movie was that it didn’t tell the whole story………. hence motivating people to investigate further! @Urbam Panther – you are amazing – you might want to share your special technique some day. @Davina – heheh – you’d best not watch it, then! From reading your latest post, it sounds like you have had all the motivation you can handle and just want to get into making things happen! The trailer doesn’t work for me either – but it did when I first looked at it last December, so I thought it was just my browser not liking it. @Ribbon – thanks Ribbon! “celebrity normal” – I like that! And I agree – there are a few other enlightened masters/mistresses around. I’d be interested to know more of your experiences with self-healing. Thank you for the sharing with me about the movie “what if” I am get that right now. I will have a chance to meet Dr Joe Dispenza next weekend. I know his work but I never seen this movie What if, so now thanks to you 🙂 I will. Giovanna Garcias last blog post..when life give you lemon make Honey instead. I just watched the movie. Very interesting. I first saw Joe Dispenza in the movie What The Bleep Do We Know (if you haven’t watched this, please do. You’ll love it. Plus it’s shot in Portland, Oregon) Obviously he has a lot to say in this body-mind potential. I will check other featured speakers too. I’m glad to read your review here. Actually I thought you did one already….which was why I watched it some weeks ago. I like the question you unearthed that you shared at the end of your post. Hmmm….it got me thinking about what “normal” is? @Giovanna – Wow! – you might be meeting Joe Dispenza on the weekend? Have a good time with what you are doing! @Akemi – I saw What the Bleep a long time ago (it seems like a long time ago) – I don’t remember Joe Dispenza – I’m not good with names unless I am involved somehow. It must have been fun seeing your home town in it! @Evelyn – when I posted the promotional clips in December I hadn’t seen it yet. I couldn’t make time until the end of Jan – and the DVD had arrived. Maybe “the new normal” is the “the new black”? That sounds exactly like my kind of movie. Can’t wait to immerse myself in it. Oh, okay, I’ll do it! Wesleys last blog post..The name’s Smith. Wesley Smith. @Stacey – the question doesn’t really make sense, because normal obviously really means how most people are – I just thought it was interesting and quirky. I think most of us would like to think we weren’t normal! @Jannie – Let us know what you think! @Mama Zen – that’s good! @Wesley – now you’re making me nervous (gulp) – maybe you would consider letting us know what you thought? Welcome to this blog! rainers last blog post..How to recognize people who don’t love? Robin I always love the way you select topics that stretch our beliefs. I once tried to live a day as Jesus would have lived and I made it for about 27 minutes. 🙂 But it was a fascinating exercise in what’s possible. To live in the absence of judgment is extremely powerful. @rainer – hi Ray – do you mean the DVD? I ordered mine from the website and it came OK – and played on our DVD player and computers, which are a different region code from the States. I haven’t tried the digital download but other bloggers I know have, so it must have worked. Love and Light to you, too! @Tom – Tom you are so funny – what happened in the 27th minute? How did you go with the loaves and fishes? Well written review. It’s a powerful presentation. I guess I’m going to have to sit down and watch this. My computer is so slow loading movies that I often give up before it’s fully loaded. “What if Jesus was the only normal person to have lived?” This is exactly the approach of Christian Science, a religion I studied and followed for more than four years. CS is one of the forbears of New Age spirituality. Jesus said that any one of his disciples could do what he did, which CS interprets as meaning anyone who believes. I had the same problem with CS that I have now — making myself believe in the absence of evidence in my life. @Anja – thanks Anja. Welcome to this blog! @Dot – I think it’s worthwhile, Dot. When we are willing to change, we just do it, and “believing” isn’t such an issue. Late to the party, but I just could not sit in a chair longer than to write my post and then do a few comments each day. The muscle spasms have been so acute. Yesterday I stopped taking all my medications….I have been a practitioner of Larry Dossey’s healing Words work since my last major cancer surgery and I am the only one left alive of the other dozen or so in my support group – So I am excited to see this movie, but terrible at downloading things. I will give it an attempt today. I am a very good healer of others – I am truly going to work on healing myself. It is not instant pudding – it is a heavy duty daily workout….when I get tired I loose ground and give in to the pill pushers. I saw the movie and enjoyed it. I too was stirred even more. I especially like the story that Dan brule told about the man named Stork that he met in a prison. This man had been in several fights and had some of his teeth knocked out. The interesting thing was that his teeth grew back each time. Stork never had been given the idea that he had only two sets (baby and adult) teeth. He did not live with that as a thought of limitation. Dan was so moved and asked the question to himself, “what would my life be like if I let go to some of the ideas that I have believed. I am letting go of the ideas so that I may live unlimitedly. Awesome film! I’m waking up! @Patricia – it’s never too late, Patricia! heheh. I know things have improved since you wrote this – I think it’s fantastic you are really going for healing yourself. @jack869 – well I’m glad you are waking up! Okay, my wife and I are sitting here, completely mystified as to how this film got by us. Never heard of it–and we both spend an enormous amount of time reading, watching and Googling everything “Human Potential-ish.” So glad to have found your blog–and we’ll be locating this DVD ASAP! Hi there Jonathan – and welcome to this blog! I hope you enjoy the movie when you see it – do let us know what you think!